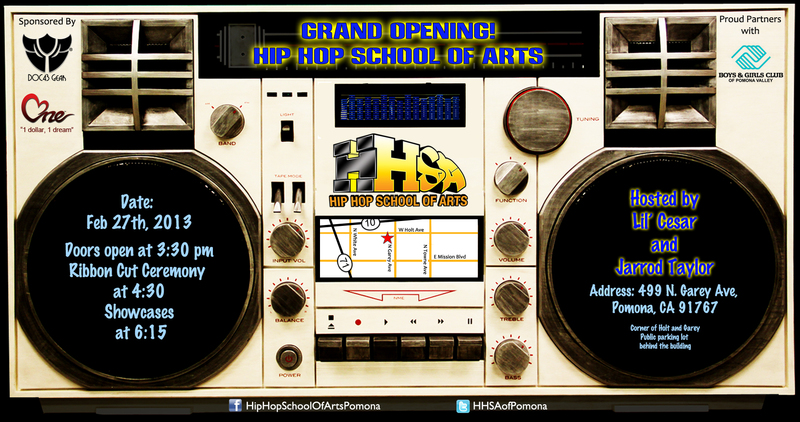 POMONA – Calif. – Feb. 11, 2013 – The Hip Hop School of Arts (HHSA) will be holding it’s grand opening and ribbon cutting ceremony on Wednesday, February 27, 2013 at 4:30pm at 499 N. Garey Ave, Pomona, CA 91767. Doors open at 3:30pm. The community of Pomona is invited to join the celebration with complimentary food and drinks, live art demonstrations, and a special showcase at 6:15pm by world-renowned artists including Air Force Crew, MC Supernatural, DJ Hazze, DJ Ralph M, and more to be announced. Confirmed guests include: Mayor Elliott Rothman of the City of Pomona; the Pomona Chamber of Commerce; producer/director of “Survivor,” Rod Spencer; director/choreographer, Adolpho “Shabba-Doo” Quinones; artist Geraldo Mejia; executive producer of “Hype Nation 3D,” Jong Lee; and global brand manager of The Bible Experience, Damuer H. Leffridge. About the Organization: Hip Hop Performing Arts (HHPA) is a non-profit organization which, in partnership with the Boys and Girls Club of Pomona Valley (BGCPV), offers a unique performing arts, technical/trade program designed to transform each student’s creative energy into marketable skills through education, guidance, and self-expression. BGCPV and HHPA offer an innovative after-school series of learning activities which incorporate academic opportunities into recreational setting. Eight week programs will be open for ages 8 and up in breakdancing, deejaying, urban art, music productions, popping, locking, emceeing, and entrepreneurship. About The Founder: Julio “Lil’ Cesar” Rivas is an original B-Boy dance pioneer who has become one of the biggest and most influential names in Hip Hop. Born in war-torn El Salvador, Lil’ Cesar escaped and found his way to one of the toughest streets of Los Angeles, where he discovered the dance form that would change his life. Lil’ Cesar now dedicates his life to serving God and his beautiful family, as well as leading the youth of today out of hopelessness and into a better tomorrow.